The ideas of Hindutva-HinduRashtra-Nationalism all are deep rooted in Bharatiya perspective far before from the emergence of Nationalism in Europe in Nineteenth Century. Hindutva-Nationalism based on foreign ideals and not indigenous: Ramachandra Guha. Actually, Hindutva and Nationalism (Rashtravad) are purely Indigenous Concepts and it is deeply connected with Bharatiya Cultural and Tradition. Upananda Brahmachari | HENB | Haridwar | Oct 29, 2017:: The left-secular breed hysterical historian Ramchandra Guha termed the Hindutva model of nationalism an ideology based on 19th Century European and medieval Middle-Eastern (Islamic) ideals which, fueled by paranoia, had thrived on the same sense of superiority while treating the rest as second-class or destroying them. “There is nothing indigenous about Hindutva.” With these words, an irritated Ramachandra Guha delineated aspects of patriotism and jingoism as he came down heavily on the ‘homogenization’ and ‘criminalization’ of dissent in India. “Hindutva’s origins, can be traced partly to 19th Century European Nationalism. It has roots in the medieval middle east where Christians and Jews were considered second class citizens in Muslim majority states,” said the noted historian who was speaking at the Bangalore Literature Festival (BLF) delivering a talk on ‘Jingoism vs Patriotism’ in the city on Saturday aimed to attack on ‘Sprawling Hindutva in Modi Raj’. Though this lefto-secular cacophony has no power to check the advancement of Hindutva in India, as an elephant goes ahead ignoring the barking dogs in a marketplace; the falsification of facts and figures presented by Guha in BLF event has exposed enough his sallow knowledge about India and its real history and culture. As a matter of fact, as the concepts of Christianity, Islam, Communism, Secularism all have its foreign roots and not indigenous anyway, the propagators of foreign schools always try to prove that ideas of Hindu, Hindutva, Hinduism all also have its root in abroad and not in India at all. In an earlier occasion, (March, 2016) another Comrade, Irfan Insane Habib tried the prove that the introduction of Bharat Mata was also a foreign concept and it came down from the concept of Roman Britannia. Then, Irfan was just kicked out by me in my article, “Com. Irfan Habib must know, Bharat Mata is not any shadow of Roman Britannia, She is the Mother of all here in Bharat+” and I substantially proved the concepts of Nation as Mother, Motherland as Nation, the Nationalism in Bharat and identity of Bharat Mata all were generated from ideologues source and never was a fruit of any foreign tree. Again, the same perpetration is seen in the claim of Ramchandra Guha, when he claims that Hindutva-Nationalism based on foreign ideals+. In many perspective Hindu Rashtra and Ram Rajya are made synonymous and it is related to King Ram of Ayodhya who is epitomized as the perfect King to maintain his kingdom on the basis of Dharma and highest public satisfaction and prosperity. Lord Ram emphatically uttered these while addressing his younger brother Lakshmana after their victory over the Rakshasa (demon) king of Lanka, Ravana and when Lakshmana opined to stay in Lanka to rule Bharata from there. Actually, we get the essence of patriotism and nationalism from here. But, not Dr Ramchandra Guha. Indians had their concepts of Rajya (state), Rashtra (nation), the Nationalism and Patriotism around them from the ages of Vedas and certainly the European concepts of nationalism had no effect on the Rishis of Vedas who propounded such concepts of Nationalism and Patriotism. In Prithivi Sukta of Atharvaveda (Mata Bhumih Putroham Prithivya etc., see verses 12.1.1 to 12.1.63) clearly reveals the understanding of earth as Mother and Motherland in its uniqueness of highest philanthropist view. One can easily understand the tenets of Patriotism, Nationalism and Philanthropy in an unique way of Mother-Son natural bonding. May this Earth, replete with seas, rivers and water sources, excellent foodgrain from agriculture, prolific vegetation and abundant living creaters, bestow upon us munificent nutrition! May the Earth who is in the nature of a mother, hold us, her sons, close to her life-endowing self, protect us, and may Parjanya (the rain-bearing clouds) in the nature of a father, tend our upbringing. May this Earth so charged with positive force, neutralise that element which impels ill-will, aggressive intention, subjugation of human beings and their elimination. May the Earth give us, her progeny, the capacity to speak pleasantly with each other, may our languages enable harmonious interaction between ourselves. May the Earth which imbues men and women with good fortune and good appearance and gives fleet-footedness to the horse and the deer and strength to the elephants, may this Earth imbue us also with radiance; let none be averse to us! In daily life, on Earth, whether we are sitting, standing, or in motion, may our activity be such as would never cause injury or grief! I evoke the Earth which gives shelter to all the searchers of truth, to those who are tolerant and have understanding, to all things strength-giving, nutritious; the source of creative spirit, we depend on you, O Earth! O Earth, in the villages, forest, assemblies, committees and other places on Earth, may what we express always be in accord with you. O Prithivī, auspicious be thy woodlands, auspicious be thy hills and snow-clad mountains. Unslain, unwounded, unsubdued, I have set foot upon the Earth, On earth brown, black, ruddy and every-coloured, on the firm earth that Indra guards from danger. O Prithivī, thy centre and thy navel, all forces that have issued from thy body. Set us amid those forces; breathe upon us. I am the son of Earth, Earth is my Mother+, Parjanya is my Sire; may he promote me. [Excerpts from the “Hymns of the Atharva Veda”, by Ralph T.H. Griffith, , at sacred-texts.com]. Actually, India nurtured the ideals and efforts for being a collective force for the public unity to protect the basic nature where they lived in a common culture. This sense of responsibility was the seed of Nationalism in Bharatvarsha, called later as India by foreigners. But, ideas of Nationalism in India was never brought from any foreign end. Indians were , are and will remain most Nationalist and Patriot than anybody. Prof Guha has no rights to depict Indians as the borrowers of nationalism from European end and nor he should prove Indians as anti-national or unpatriotic inter alia. In Bangalore Literature Festival, Ram Guha actually lost his sense when he told, “Hindutva’s origins, can be traced to 19th Century European Nationalism”. The concept of 19th Century (1801-1900) European Nationalism has its history of Nationalism refers to the devotion for one’s own nation’s interest over those of all other nations. It signifies a particular love for the nation. It was an important factor in the development of Europe. But, this had no link with Indian connection or never any Indian ruler tried to conquest others by suppressing other’s interest, so inspired by European Nationalism in a Semitic fashion. Prof Guha must not forget the history of Hindu-Pad-Padsahi+ which is the basic foundation of modern Hindutva in India. 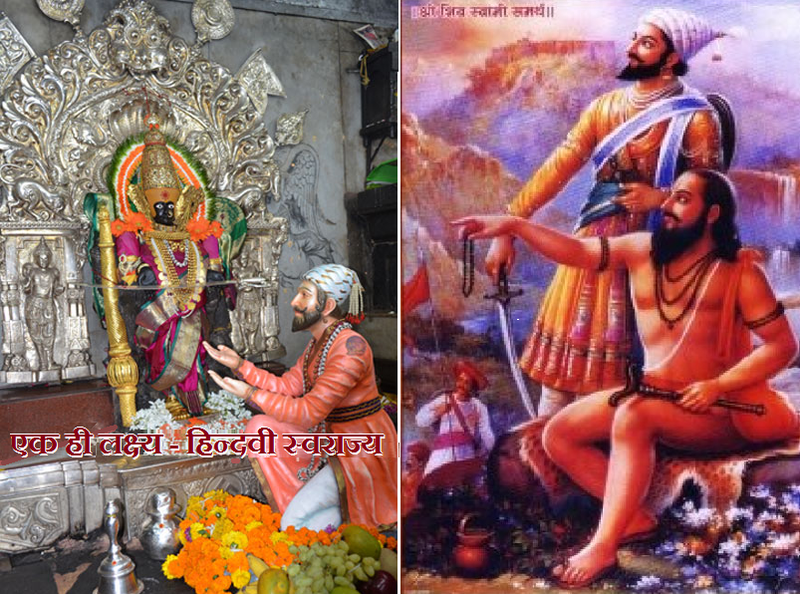 Maratha Hero King Shivaji (1627-1680) who established a Hindu Sovereignty in Marathawada in 1674 under the Hindutva guidance of his Guru (mentor) Smartha Swami Ramdas. It is quiet difficult to understand who came to Samartha Swami Ramdas or to Chatrapati Shivaji Maharaj to exhort the Nationalism or Hindutva from any European part. 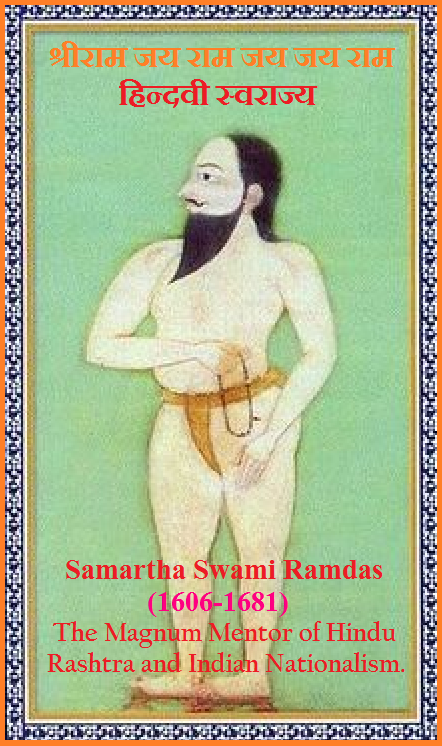 Smartha Swami Ramdas (1606-1681) left his home on 1618 and traveled through out India for 12 years and started to establish Akhada and Mutts numbering 1100. He was inspired in a warrior valour by sixth Sikh Guru Hargobind in his meeting in Srinagar. Afterwards he dedicated his life for the revivalism of Hindu Dharma and created a Hindu Pad Padsahi by Chatrapati Shivaji long before the emergence of nationalism in Europe just in nineteenth century. Thus, the claim of Ramchadra Guha for ‘Hindutva-Nationalism as an European concept’ is just bogus and concocted with malafide intentions. Hindutva and Nationalism (Rashtravad) are originally Indigenous Concepts and it is deeply connected with Bharatiya Cultural and Tradition. Hindutva and Nationalism in India are never the fruits of European thoughts. Later, the Hindutva concept was propagated by Tilak, Vivekananda, Aurobindo, Savarkar, Hedgewar and so on. __Agencies. Courtesy: The Links and Pic sources used above. This entry was posted on October 29, 2017 by hinduexistence in Anti-Hindu, Anti-Indian, Attack on Hindu Sentiments, Attack on Hindus in India, Attack on India, Attack upon Hindus by Marxists, Attack upon Hindus by Secular, Breaking India by Communists, Conspiracy against Hindus, Conspiracy against India, Hindu Advocacy, Hindu Awareness, Hindu Culture and Tradition, Hindu Discourse, Hindu Heritage, Hindu is Nationalism in Hindustan, Hindu Knowledge, Hindu Nation-State, Hindu Nationalism, Hindu Proliferation, Hindu Rashtra, Hindu Reality, Hindu Research, Hindu Roots, Hindu Saint, Hindu Scriptures and Hindu Research, Hindu Solidarity, Hindu Tradition and Culture under attack, Hindu Wisdom, Hindus attacked by Media, Hindus under Attack, Save Hindu Dharma, Save Hindu Dharma from anti Hindu Conspiracy and tagged 19th Century European Nationalism, Aurobindo, जननी जन्मभूमिश्च स्वर्गादपि गरीयसी, Bangalore Literature Festival, Chatrapati Shivaji Maharaj, Christianity, Communism, Concept of Bharat Mata, Hedgewar, Hindu-Pad-Padsahi, Hindutva and Nationalism (Rashtravad) are originally Indigenous Concepts: Upananda Brahmachari, Hindutva and Nationalism not connected with European thoughts: Upananda Brahmachari, Hindutva and Nationalism with Bharatiya Cultural and Tradition, Hindutva-Nationalism based on foreign ideals : Ramchandra Guha, Hindutva-Nationalism not indigenous: Ramchandra Guha, Islam, Jingoism vs Patriotism, Motherland as Nation, Nation as Mother, Nationalism and Lord Ram, Patriotism, Prithivi Sukta of Atharvaveda, Rajya (state), Rashtra (nation), Savarkar, Secularism, the Nationalism, the Nationalism in Bharat, Tilak, Vivekananda.